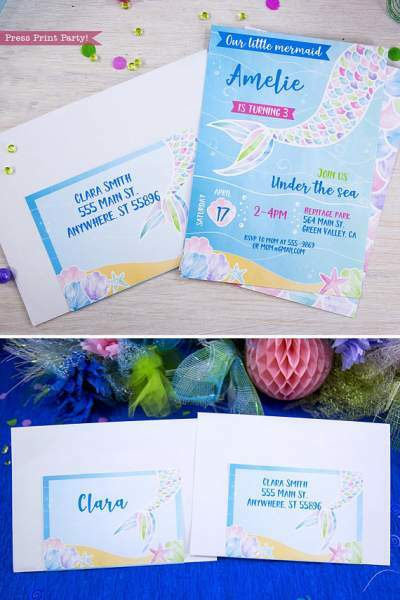 Amazing Under the Sea Decorations (VBS or Party) - Press Print Party! 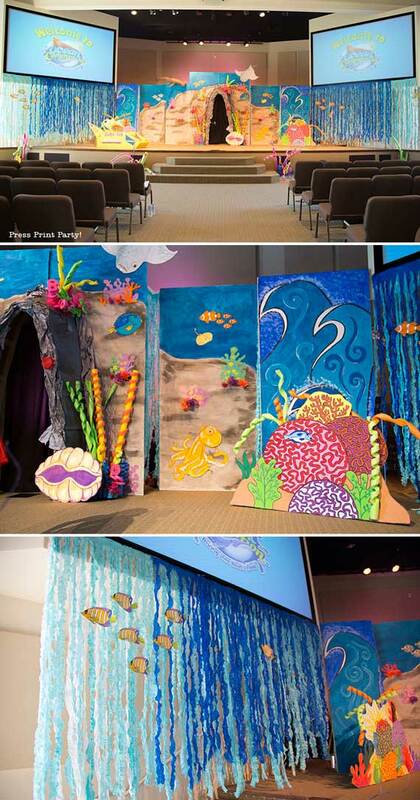 Some outstanding talented people put together this amazing display of the bottom of the ocean for our Vacation Bible School. 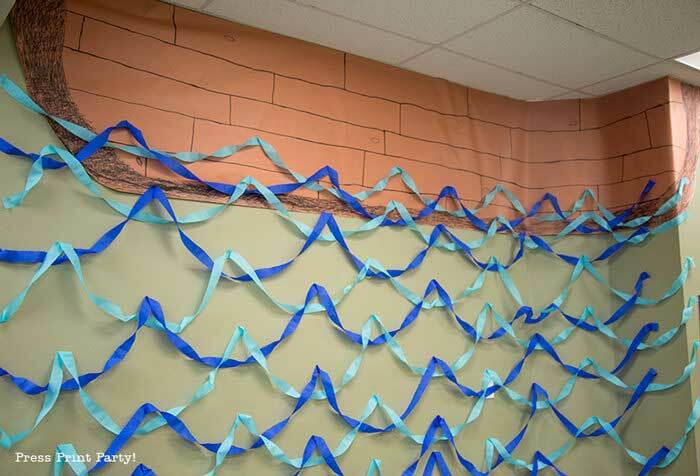 Our theme was Ocean Commotion. 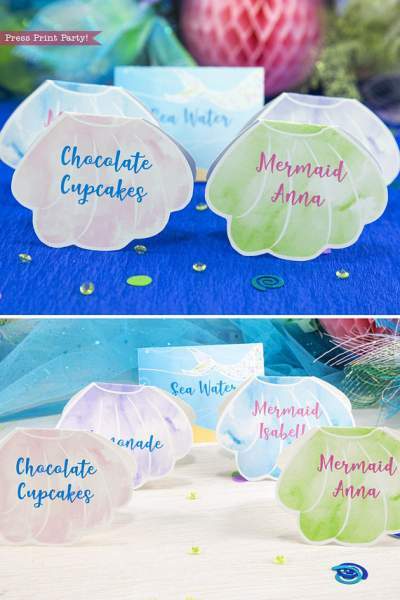 I attempted to take pictures of all the wonderful decorations and bring them to you here so you can get inspired for your under the sea party, mermaid party, or even luau. 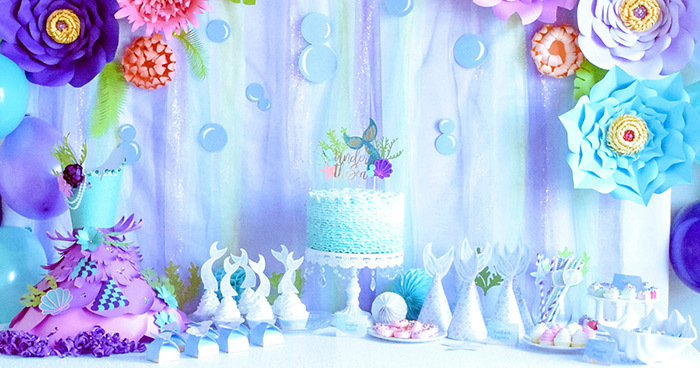 When you entered the sanctuary, the stage gave the immediate feeling of being under the sea. 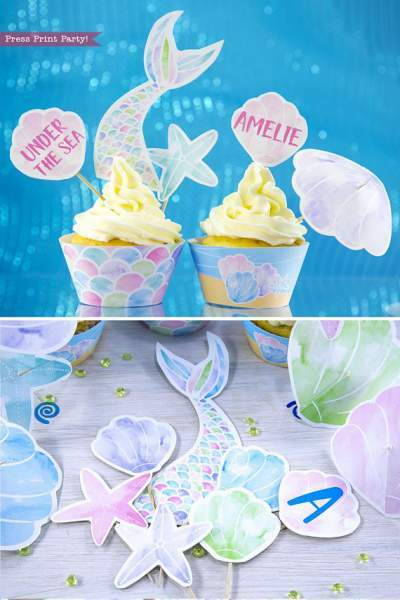 The water effect on the top picture is just plastic tablecloths cut in strips (leaving a couple inches at the top), and each strip stretched outward every couple inches. 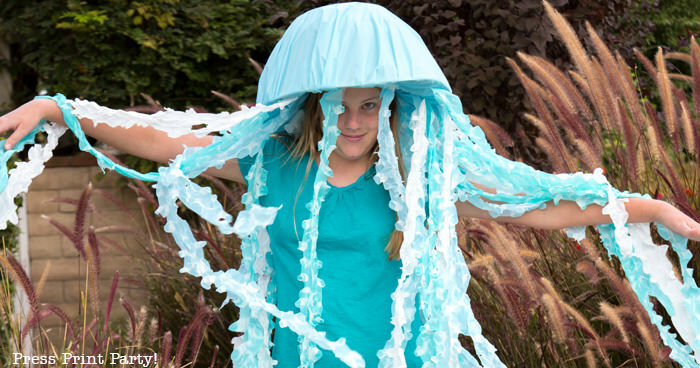 I used this fun technique in my DIY Jellyfish costume also. 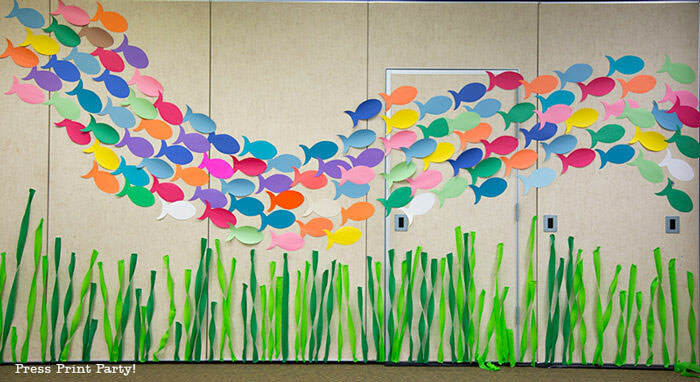 Quick and easy, this dynamic school of colorful paper fish worked beautifully to cover a large walled area. 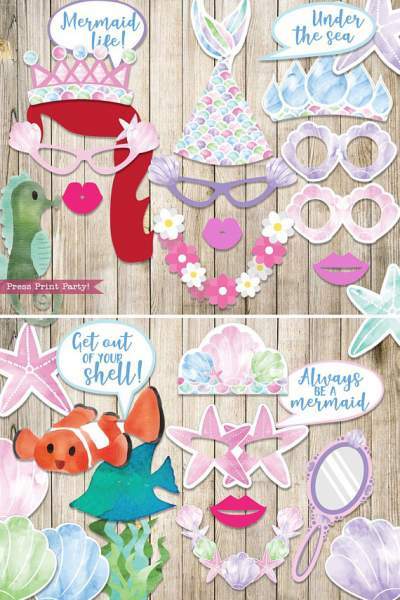 We made a template to distribute to several ladies so each fish would be exactly the same. Pool noodles cut in all kinds of ways made interesting reefs. 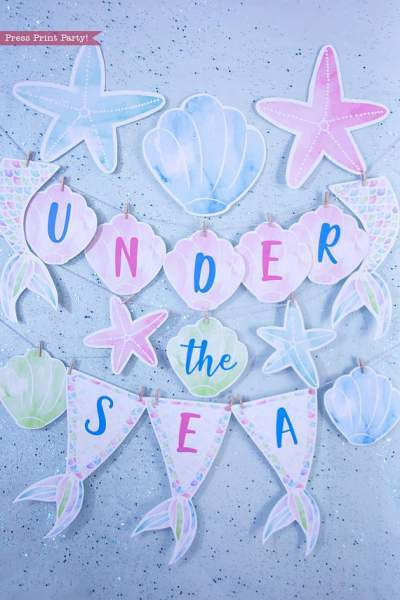 The sea urchins were little foam balls pocked with toothpicks and spray painted red. 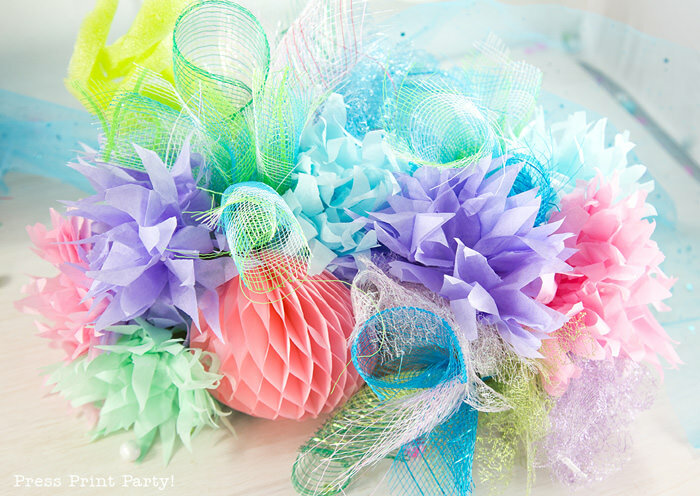 Create a stunning coral reef out of tissue paper, floral mesh and other household items. 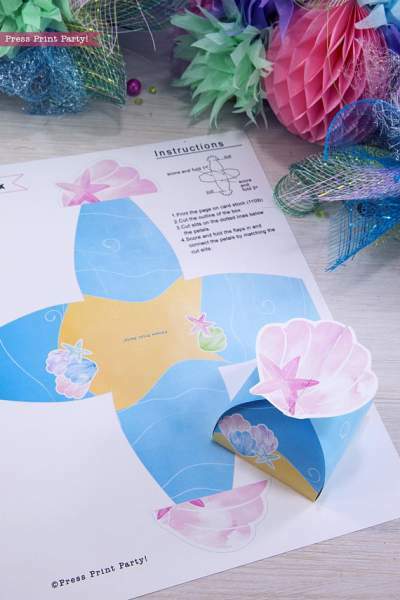 See the tutorial on how to make a coral reef decoration. 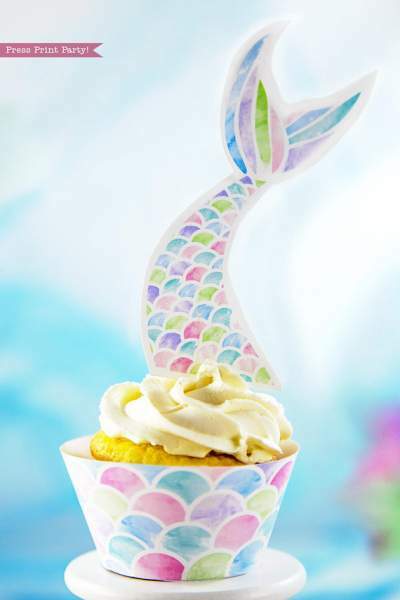 Fish crafted from colorful paper plates are amazingly simple and a bright way to cover a big wall. Love the black ray! 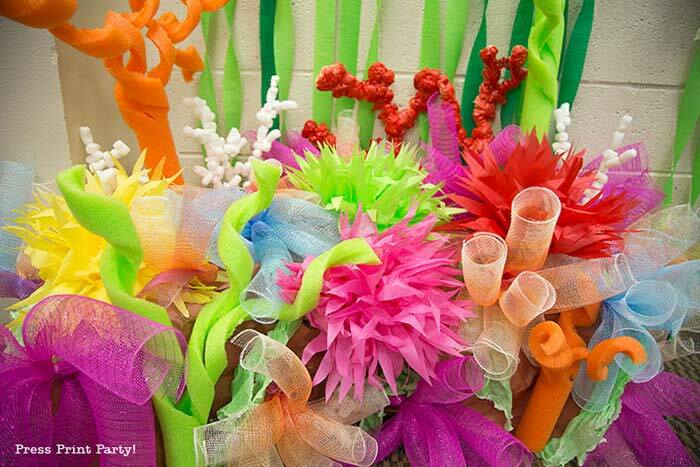 These jellyfish made from paper lanterns create a lot of impact. The tails are strips of plastic tablecloths ripped and stretched. Noah’s Ark on top of the waves. Hi. What a cute set up! 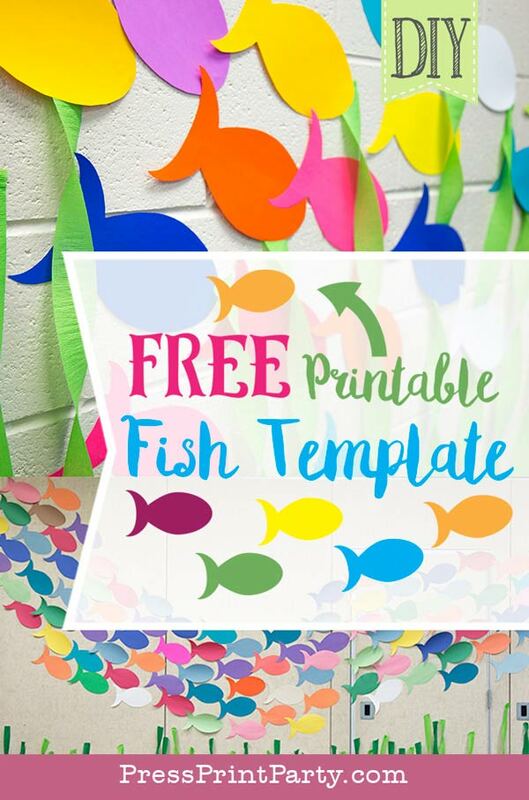 Can you let me know what paper you used for the school of fish on the fish wall? 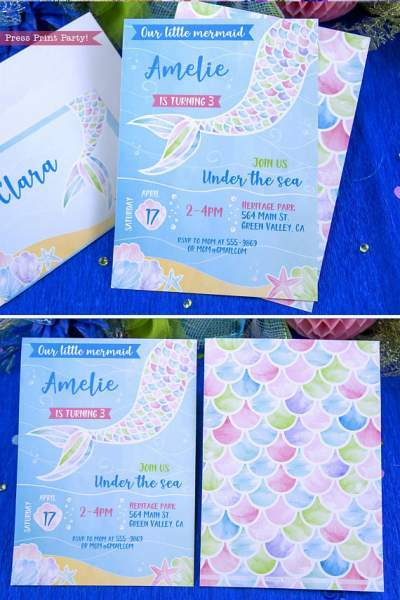 I already downloaded the template but I like that specific color combination and was wondering if you got a packet of multi color paper any where specific? Thank you so much! I honestly don’t remember which color packs I bought but I’m pretty sure I bought them at Wal-mart. I used a bunch of colors I already had at home too. 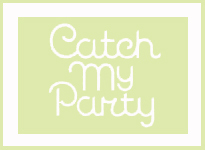 I can’t wait to see yours! Im in love with the fish wall! 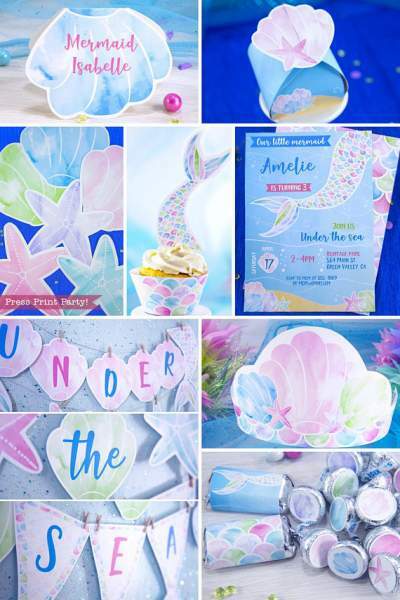 Can you let me know how to download the free template? The link below seens to be dead. Thanm you! 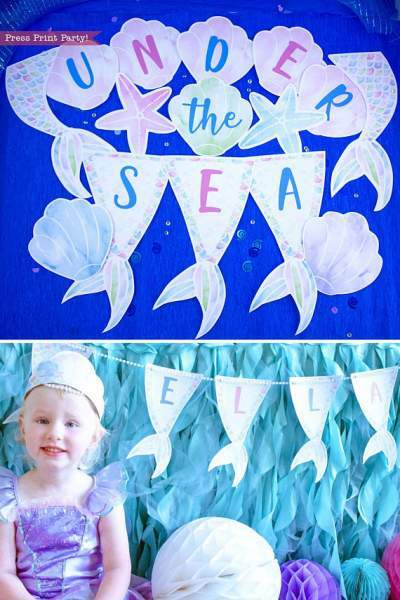 The link is a text link right below the long fish wall picture. It is hidden by the sign-up box. As soon as you fill in the sign-up form you’ll see the link underneath. This is one of the most incredible set I’ve ever seen. Please tell me where you got the backdrop with lights behind the sheer curtains. And what kind of lights you usef. Appsolutly lovely!! I am completely floored ..at the bottom of the sea, by your creativity! What an amazing experience this must have been for the children if all this effort when into making the surroundings so awesome! 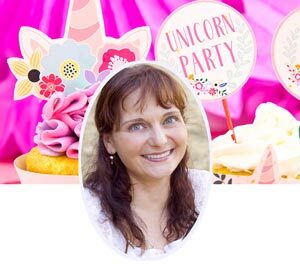 Thank you so much for your kind words Marguerite. It was a group effort. That was the best theme we have done so far! What scripture(s) did you focus on? 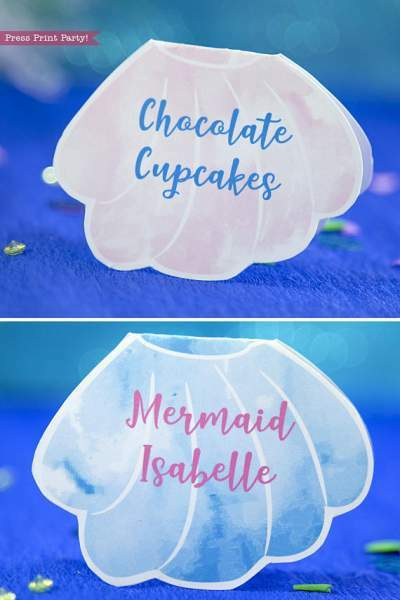 This is such a cute idea!!! Hi Jessie, Thanks for your kind comment. It was a theme from Answers in Genesis. 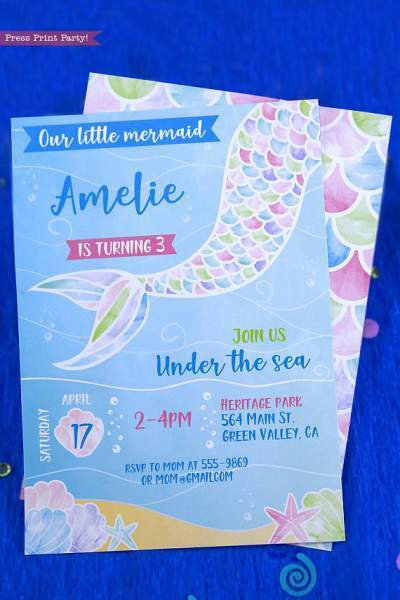 I’m sure you can find the theme on their website. It was such a good time. Thanks! 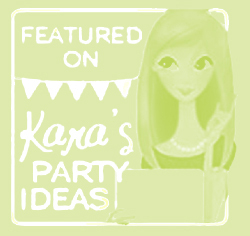 Absolutely LOVE so many of your ideas! 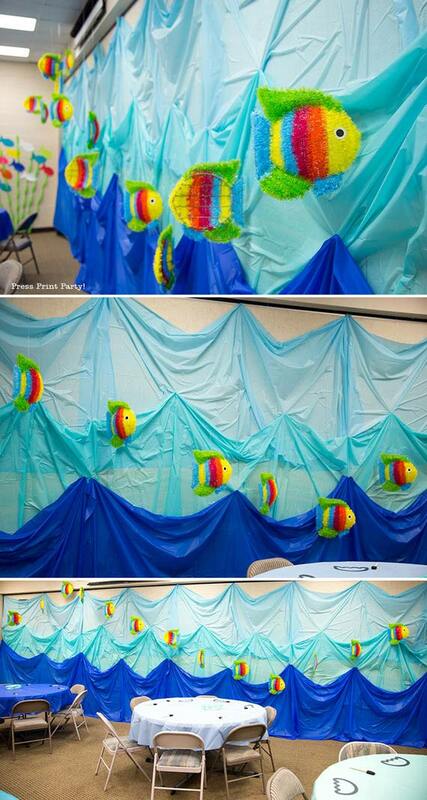 Going to use many of your ideas for a Cub Scout Blue and Gold Banquet “Cubs Under the Sea”. I wish I had an idea how much it cost to make each piece, to know whether or not I can get various materials. Also, where do you get floral mesh?? Does it come in different widths? If so, how wide do I want to purchase? Someone gave me some to make I wreath, but I think it’s not wide enough for this project. The stuff I have is probably 3 or 4 inches wide. I would recommend a 20″ wide mesh. 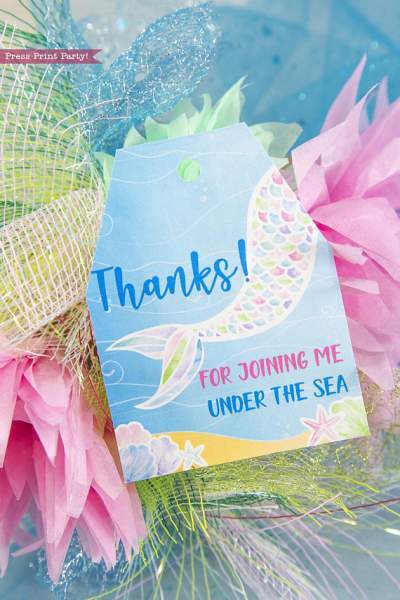 You should be able to buy it a the fake floral department of any craft store. 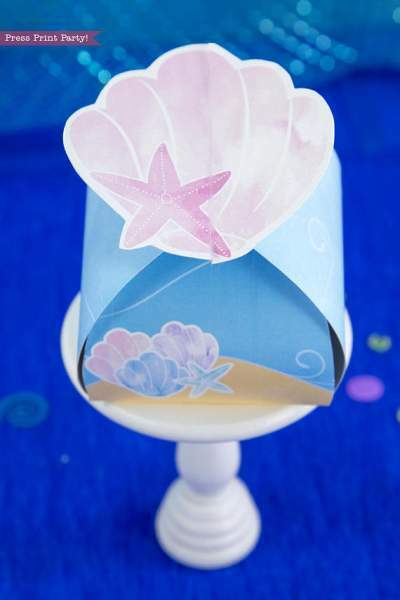 The cheapest craft in here is the paper fish school. It also has such a great impact. Have a great time decorating. 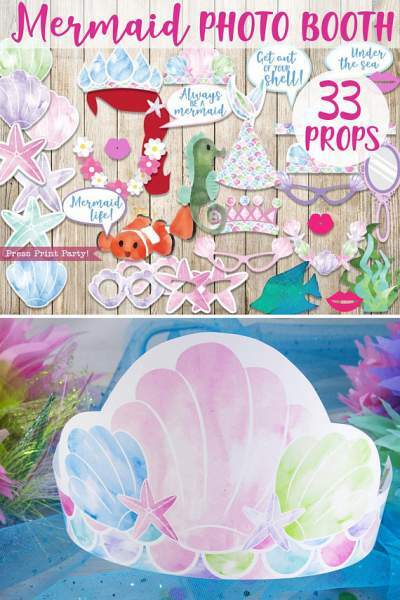 Pingback: How to Make a Coral Reef Decoration - by Press Print Party!